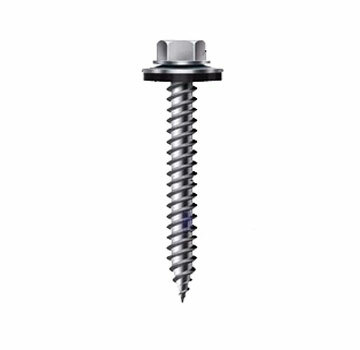 PRODUCT: EVERGRIP #E4460-CUF, #9 X 2-1/2" STAINLESS STEEL HWH SHARP POINT SCREW WITH SEALING WASHER. 250/BAG. PRICE/BAG. • Head and the majority of shank is 304 Stainless Steel, with a welded, hardened carbon steel point for self drilling performance. • Provides the corrosion protection of stainless with the drill performance of a carbon steel fastener. • Designed specifically for corrosion resistance in new wood treatments (ACQ/CA). • 9 – 15 HWH Sharp Point. • Self drills through the metal panel and taps into wood substrate. • Min penetration in wood substrates should be no less than 1"